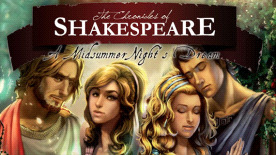 Experience one of the Bard's most beloved tales in The Chronicles of Shakespeare - A Midsummer Night's Dream, a wonderful point-and-click journey. One of Shakespeare's magnificent plays, here's your chance to experience it as never before. Live the lighthearted antics of the events surrounding the marriage between Theseus, Duke of Athens, and Hippolyta, Queen of the Amazons. These include the adventures of four the young Athenians and the six amateur actors of the play within the play. Journey along with the young Shakespeare and see the antics play out in this fun adventure. Explore all of the fantastic locations made famous by his work. Solve a host of dazzling puzzles and mini-games. Come face-to-face with all of the astonishing characters created for this beloved play. Enjoy the famous and comical tale in this wonderful point-and-click Adventure. Explore all of the fantastic locations made famous by Shakespeare's work. Solve a host of dazzling puzzles and mini-games. Experience all of the magnificent events as never before.